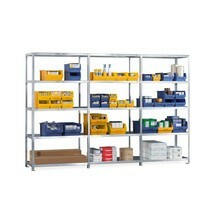 Your goods, tools and spare parts will be well organised and easily accessible on this shelf rack base unit. The shelves are open on both sides and can be adjusted in height via the hole pattern. These boltless, tubular steel shelves represent a perfect combination of durability and flexibility. You can configure them according to your specific application and storage requirements. The surfaces of the racks are galvanised making them particularly durable and low-maintenance. 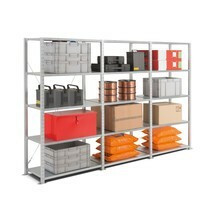 Are you looking for a shelving unit to store heavy materials? Then why not opt for a shelf rack base unit with tubular steel shelves. A particularly practical feature is that you can access the shelves from both sides. 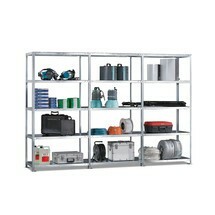 The shelf rack base unit with mesh shelves can be accessed from two sides. You can supplement it with add-on units as required. Assembly and conversion is a breeze thanks to the ingenious boltless system. This shelf rack with steel plate decks provides quick and simple storage for medium-weight items. 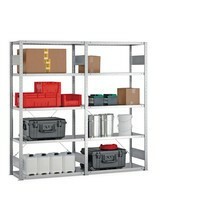 The shelving is double-sided for quick storage and rapid retrieval of your goods. 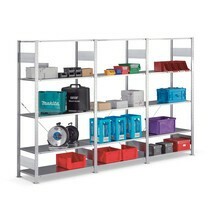 The META shelf rack with bolted assembly offers optimum storage space in any location. 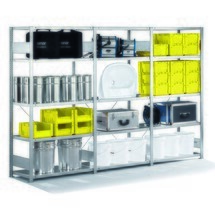 Combine the base unit with the add-on units from our range and benefit from an efficient, bolted storage system.